This is a composite image looking to the northeast on August 14th near the peak of the Perseid meteor shower, the view also features some nice air glow (the source of the green color), the Andromeda Galaxy and the Pleiades Cluster to name a few. After getting the camera set up pointing towards the radiant I let it run all night which resulted in over 650 frames. From that collection I selected roughly 25 frames for blending into this composite image that highlights the meteors I caught over the course of the evening and some frames with my light-painting on the foreground. The image was taken in southern Wyoming near the Laramie River just off from where we were camped. 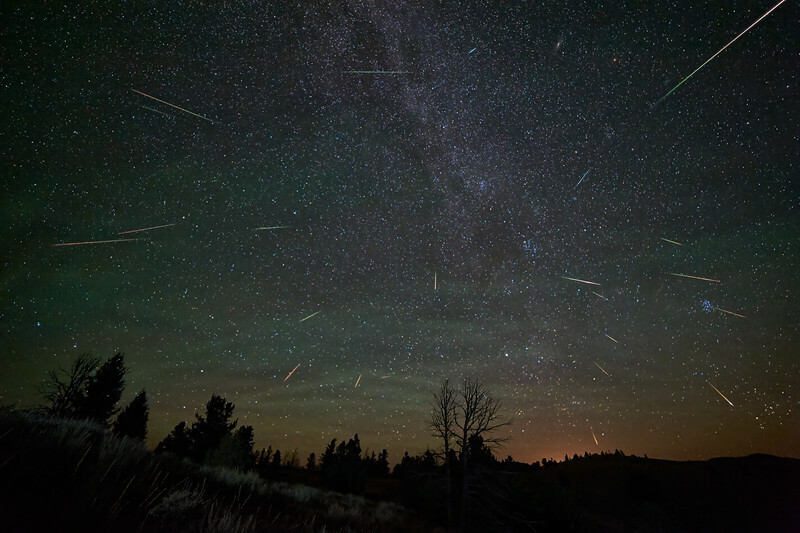 The new moon afforded us some really dark skies for star viewing and many of the meteors were memorable. It was a really fun trip!